I am one among those thousands of ordinary guys who have known the streets of Darjeeling like the back of our hands, and slogged our shoes through countless alleys of the town. I have seen the town grow with me from the times I can remember; in fact it has grown faster than me. And for anyone who is closely familiar with the smell of the town, they know that the pivot points of the town aren’t at the places where the outsiders find the most of the charm; the main pillars that hold the soul of the town for us are different. Chowrasta would be the first place on the list to start with. From feeding someone’s mind during the lonely hours, to getting absorbed in someone’s daily habit – Chowrasta has done it all. The day at Chowrasta starts very early. The joggers start sweating out around the mall road even before the sun wakes up. 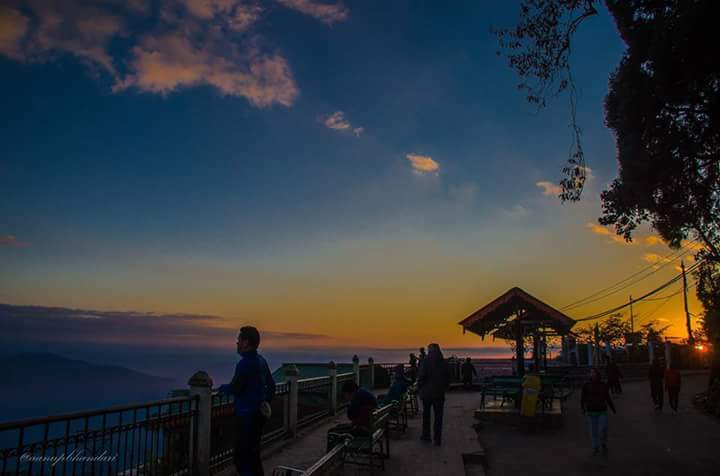 The “hawa ghar” at the back side is fully entertained by a number of fitness buffs, stretching themselves among the exercising structures there, while the first rays of the sun starts coming out from the horizon. Most of them are enriched by the magnificent view of the sunrise, while some of them prefer to find their joy looking at the beautiful girls jogging around. Meanwhile the tea and coffee vendors start their day and their job and the number of joggers goes on increasing too. That legendary “Hawa ghar” is a wicked multi-tasker though. While it hosts the fitness enthusiasts (some of whom do yoga too) in the morning, it becomes the hub of smokers throughout the day. I didn’t say they smoke weed though. No, I seriously didn’t mean to say that. They could be smoking anything (Perhaps Iskuss ko Patta). But the best thing is that they never harm anyone or interfere into anyone’s business. Well, the day starts breaking. The Sarangi wala fills the air with his melodious tune and his mild voice near Keventer’s, the fencing around the fountains serves as a place for the ponies to be tied and the huge TV starts playing National Geographic (The TV sometimes plays Coke Studio Songs too to slow down the pace of the romantic evenings, but just for a record, it must have played “Darjeeling Goes Fillili” the most number of times). The benches around Chowrasta start filling up and the gallery hosts a lot of people too. Faaleys and Shikhar Cigarettes are getting sold in full scale at the “stable terso” and people are doing rounds around the mall road. The old people start coming one by one with grains to feed the birds and the birds are desperately waiting for them. I have never seen birds so comfortable among people in fact. The dogs on their part are running around or sleeping. I have no idea what makes the dogs so happy, but then they are always overwhelmed with joy and they don’t have a reason for that I guess. The statue of Bhanu Bhakta is quietly watching the couples and the groups of friends pass by. He is meanwhile posing perfectly for anyone who wants to take a quick photo with him. He has seen the place through it all and he knows that it is beautiful. To add to everything, if your day is good, you also get chased by a group of monkeys around. The days are good and the evenings get better. Darjeeling is a town that loves to fit in things. The houses fit in over the roads and jhoras, “Luga sukawney Taar” fit in along the streets and on the terraces, playgrounds fit in on the streets. It is the place where the “Doma ko line” would fit above the Bata Stairs, a place where “Narayan Das Ko Paan” with all the struggles fits into your mouth, and a place where you can still fit in one more peg even when you are fully drunk. And correspondingly the Dali Stand and the Singamari Syndicate know how to fit in people inside the taxis. The flock of people at the Dali stand waiting for the next vehicle to arrive, meanwhile strategizing their way to capture a seat in the same, displays the ultimate level of management skills. I personally feel that your chances of securing a seat are high if you directly try for the back seat and sneak inside, while the others are struggling for the first and the second seat. At the same time there is a different story going at Singmari Syndicate. You find an ancient maruti van with an old withered wooden signboard having three faces with 1st turn written on it and get into it and the van takes you to Singmari “neutral ko neutral mai”. However, in both the cases, you have to sit inside the taxis “chepti chepti” and that’s the specialty of the locals sharing taxis of Darjeeling. After all, that much rushes of passengers for your vehicle is expected at least when you are buying your membership with the syndicate at the price of a brand new SUV. Chowk Bazaar now is the equilibrium point of the town. You have the Iconic “Bata Agaari” there. Not even Bata is as important to the town as “Bata Agaari” is. Bata could do away with the town one day perhaps, but even if it does so, “Baata Agaari” shall still remain as it is. You need to meet someone, you go there; you need to buy a newspaper or recharge vouchers, you go there; you need to travel to Siliguri, you wait for a vehicle there. In fact, more people board vehicles to SIliguri from this place than all the syndicates in the town combined. That’s a spot you have to cross at least once if you are around the town. Gitangey Daara is another imperative point that Chowk Bazaar has for us - The same place that has hosted the most historic speeches of Darjeeling in the past. It has seen the town grow from above. It has witnessed the changes in the prices of stuffs in the market below it. It has everyday smelt the fragrance of sweets, samosas, momos, typhos and thukpa that travel from the corners of the bich galli since decades. It is the place opposite to which all the major announcements and concerns of Darjeeling are pasted as posters. The place that ultimately informs you if there is going to be any strike or not. It is as important these days too, as most of the shits come out of the same place in the town. The irritating rented speakers serve the useless speeches while the people care enough to not give a damn and continue with their work. Doesn’t matter if you are standing before Kalyan Medical, buying chips at the “Bhuja Dokan” of Chowk Bazaar, buying vegetables, spices, groceries or stuffs at “Bich Gully”, or having tea at the 8 number or at Narayan Das, you have now gained enough expertise in dodging the irritating noise with all the easiness. Since we don’t pee by the streets and since we often need to pee when around the town, “where to pee?” becomes the most important question and an ideal guy around the town knows the right spots at every place to take a loo. Thanks to the chain of numerous Public toilets around the town and thanks to the toilet at the Inox (as we call that Mall or Big Bazaar). The Rink mall zone is one of the other most influential places around. The place stretching from the Mahakal or Dragon Market to the Rink Mall and again across to Beni’s and the substitute pack of small shops ahead of it hosts all the folks around who have nothing to do and aren’t around Chowrasta, or the folks who are out for serious shopping or a movie. Any which ways, the place remains colourful all the while. These spots have some serious connections to us. Perhaps each one of us will have a story to tell about these places in the times to come, or perhaps those places will have stories about each one of us to tell in the distant times to come.